• There are 149 rooms and suites. • Rote Bar restaurant, the Anna Sacher restaurant to purpose a Viennese menu and the Café Sacher. • Conference facilities, 2 outdoor pools, a spa, activities sauna, a fitness center, and a massage room. 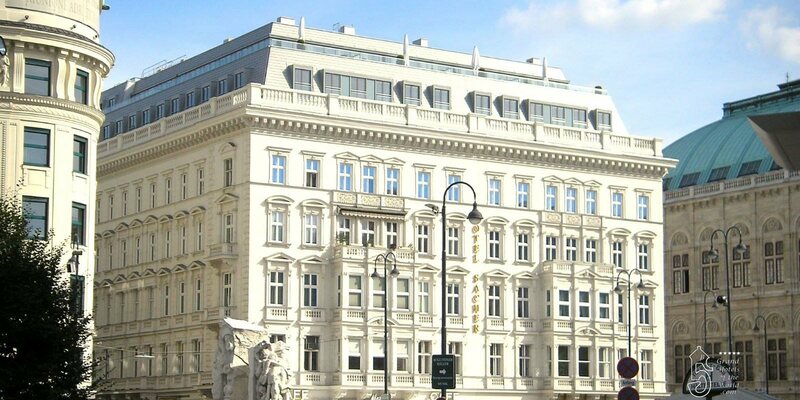 • Located in the heart of Vienna, face to the national Opera and close to the Kärntner Strasse and an underground station. • 1876: Opening of the Hotel by Edouard Sacher. • 1880: Marriage of Edouard Sacher and Anna Fuchs. • 1892: Anna Sacher, the widow of Edouard Sacher becomes the general manager. • 1930 February 25: Death of Anna Sacher. • 1934: The Hotel is in financial difficulties and files for bankruptcy. • 1934: Acquisition of the Hotel by the lawyer Hans Guertler and Josef Siller, owner of the cafe Siller. • 1936: Renovation of the Hotel. • 1945: The Hotel survives World War II almost undamaged. • 1945: After end of World War II Brisith Occupancy forces of Austria use the Hotel as their headquarter. • 1949: Death of Joseph Siller. • 1951: Restitution of the Hotel by the British Occupation forces that leave Austria. • 1952: New Renovation of the Hotel. • 1962: Death of Anna Siller, widow of Joseph Siller, the Guertler family takes over the rest of the Hotel Sacher. • 1970: Rolf Guertler (2nd generation) becomes General Manager of the Hotel. • 1970: Peter Guertler (3rd generation) becomes General manager of the Hotel. • 1973: Marriage of Peter Guertler and Elisabeth Mauthner. • 1990: Elisabeth Guertler (wife of Peter Guertler) becomes General Manager of the Hotel. • 1999: Elisabeth Guertler becomes head of the organisation of the famous Vienna Opera Ball. • 2006: Renovation of the Hotel under the Architekts Frank & Partner and the interior designer Pierre Yves Rochon, addition of another floor including a Spa. • 2007: Elisabeth Guertler becomes head of the « Spanische Hofreitschule ». • 2009: Elisabeth Guertler is awarder Hotelier of the Year.